Last Friday, before the opening of the Feria de Abril here in Seville, I gave a conference on my two perspectives on bullfighting: from far away – England – and far too close – the sand of the bullring. This past Easter Sunday, a British diplomat, Lord Tristan Garel-Jones, made a defense of bullfighting from the lectern of the Lope de Vega theatre in the classic Pregón Taurino, ‘Taurine Proclamation’, of the Royal Maestranza of Seville. Bullfighting has always appealed in one way or another to the English. For some, it is a show that, far from their Anglo-Saxon culture, they describe as barbaric. For others it may mean something curious, full of mystery and romance. Such was the case of Joseph William Forbes, a boxing manager who every summer went to Spain for his own particular taurine “tournament”. As do the members of the Club Taurino of London, who every year visit our city to attend the bullfights of the April Fair. 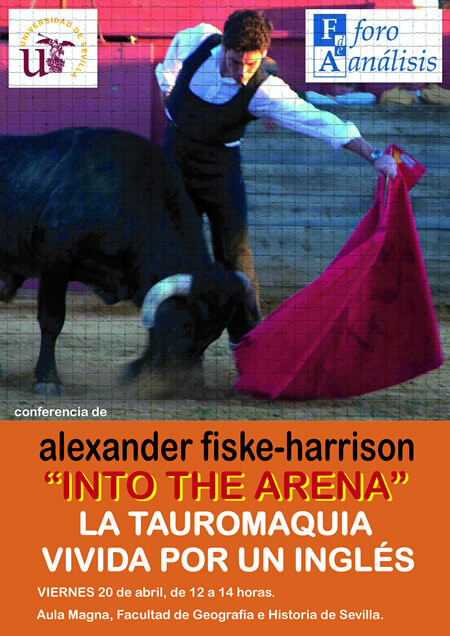 Alexander Fiske-Harrison is an English writer and actor, whom we find at the entrance of the Plaza de Toros. Several years ago now, he began to have contact with the world of bullfighting, with the help of family and close friends. Little by little, he went deeper into the secrets of the world of the bulls. He became an amateur bullfighter, fighting on the ranch “Zahariche” of the Miuras, and arrived at the point of killing a Saltillo bull on the ranch of the Moreno de la Cova family. He became friends with bull-breeders, with bullfighters like Juan José Padilla and Adolfo Suárez Illana. His experiences are contained in the book Into The Arena: The World Of The Spanish Bullfight. 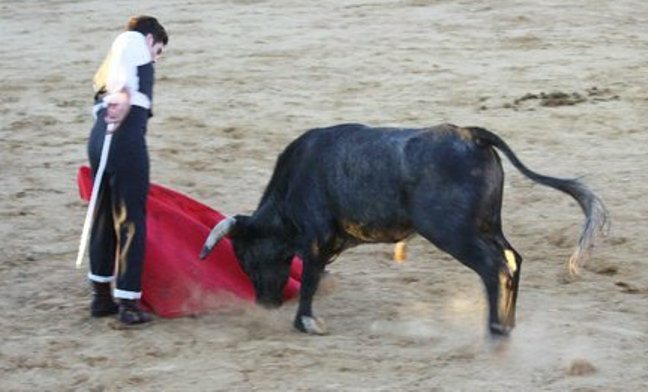 As a philosopher and writer specializing in analyzing the behavior of animals, he recognized in England that there is a lot of hypocrisy about bullfighting. Last week gave a lecture at the University of Seville, explaining his vision of bullfighting. Fiske-Harrison opens a new door, fundamental and necessary, to the Fiesta Brava in Anglo-Saxon culture. I enclose the text of my speech below. The text of Lord Garel-Jones’s Pregón Taurino, which he has kindly provided to me in English (his speech, like mine, was delivered in Spanish), is viewable as a PDF by clicking here: El Pregón Taurino de Lord Tristan Garel-Jones – English. I will finish by saying how happy I am that after leaving a lecture like this, the entire audience went to the Seville bullring, La Plaza de Toros de la Real Maestranza de Caballería de Sevilla (in whose 250-year-old library, Into The Arena is the only book in English). There we saw the very essence of what I was talking about in terms of beauty in the toreo of José Mari Manzanares who cut four ears and left on the shoulders of the crowd through the Gate of the Prince. (We met in the training ring a month ago.) I must also mention the astonishing valour of the now one-eyed Juan José Padilla. 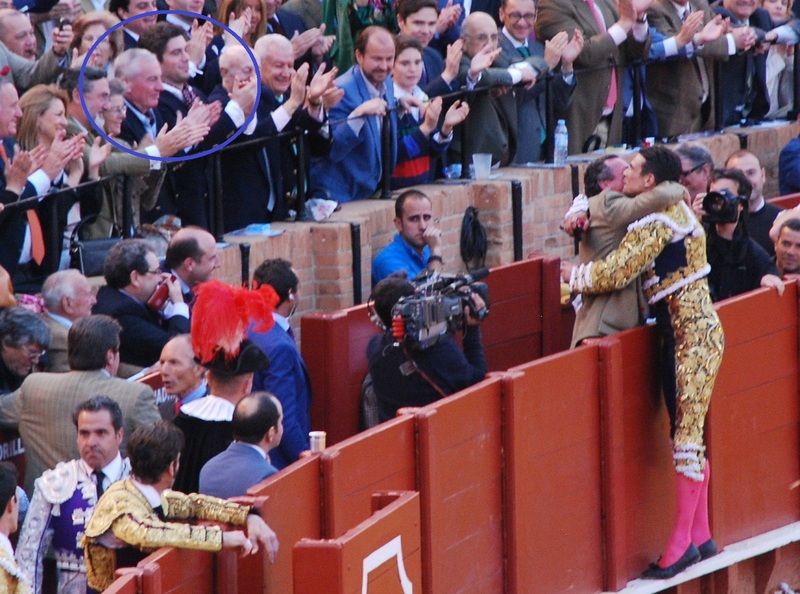 In the photo below, by the historian and author Guy Walters who was sitting with my mother and my girlfriend, you can see Manzanares embracing his father, a former matador of great note. Circled left are myself and my own father, in seats generously provided by Enrique Moreno de la Cova and Cristina Ybarra. Leaning on the planks in the foreground is Padilla. 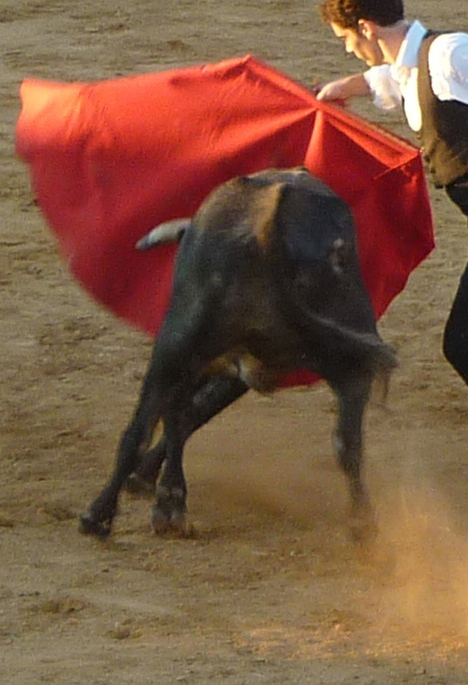 You will forgive me but in the eighteen months since I completed the research for my book I have forgotten as much of my Spanish as I have of my bullfighting – as a little bull of Astolfi discovered to his delight a week ago. However, I hope that more language remains than my technique of tauromachy and that I walk away with fewer bruises! First, I would like to thank the University of Seville – and especially Jose Luis and Antonio and their Forum of Analysis for inviting me, an Englishman, to speak about my perspective on the bulls. I was going to say that this is a rare honour indeed, until I read in the newspaper that my fellow Briton, Lord Tristan Garel-Jones, was doing just that two weeks ago. I would like to say it doesn’t count, because he is Welsh and not English, but then I might offend my dear friend and deep aficionado Noel Chandler who is here today. Also, since Lord Garel-Jones’s talk was the annual Pregón Taurino of La Maestranza, and it was delivered with such eloquence, I must doff my cap, and have provided a copy of it courtesy of its author. A TALK tonight by Oxford bullfighter Alexander Fiske-Harrison has been cancelled. Mr Fiske-Harrison mounted a fierce attack on Blackwell’s for cancelling the event, rescheduled to today after the Broad Street bookshop postponed the original talk because of security fears. But he has now accused Blackwell’s of overstating the threat, scaring people away from tonight’s rearranged talk. Tony Cooper, manager of Blackwell’s, said: “After several conversations with Alexander Fiske-Harrison we decided to cancel the event due to the small number of tickets taken up. Despite initial interest in the lunchtime talk this did not carry forward into a full evening talk by the author. Mr Fiske-Harrison, 35, spent two years in Spain’s heartland of bullfighting with matadors and breeders, talking with fans and training to fight bulls himself. Alexander Fiske-Harrison with a 3-year-old Saltillo bull. On Thursday, February 9th, at 7pm I will be giving a talk on my book, Into The Arena: The World Of The Spanish Bullfight at Blackwell’s Bookshop on Broad Street, Oxford. Tickets are free and are available by calling 01865 333623. Fiske-Harrison’s argument that the interplay between man and bull, when done with the highest skill, merits the tragedy will not convince many readers. But his descriptions of the fights are compelling and lyrical, and his explanation of different uses of the matador’s capes is illuminating. One begins to understand what has captivated Spaniards for centuries. This complex and ambitious book examines not only life in the bullring but also Spain’s cultural identity and modern ideas of masculinity. Fiske-Harrison admits that with each of his fights he knows more, not less fear. When he kills his first and only bull he feels not triumph but overwhelming sadness for a life take. Provides an engrossing introduction to Spain’s “great feast of art and danger”…brilliantly capturing a fascinating, intoxicating culture. Uneasy ethical dilemmas abound, not least the recurring question of how much suffering the animals are put through. But this remains a compelling read, unusual for its genre, exalting the bullfight as pure theatre. Fiske-Harrison did not expect to fall in love with bullfighting when he saw it for the first time in 2000. A philosophy student and member of the World Wildlife Fund and Greenpeace, he would argue with his brother about animal cruelty. But then he travelled to Seville and had his eyes opened by the beauty, dignity and art of the sport. Fiske-Harrison recounts his year spent studying the matadors, breeders, fans and the bulls themselves, set against the backdrop of the campaign to ban bullfighting in Catalonia.